Pilates is a dynamic mind–body exercise system that uses low-impact movements to improve flexibility, muscular strength and endurance. Its focus is on correcting the alignment of your posture, building your core strength and muscle balance. We deliver each exercise using techniques that ensure that they are safe for anyone. We combine the key elements of Pilates with the expertise of our tailored clinical instruction and program design to cater to every client’s individual needs, from rehabilitation to performance. 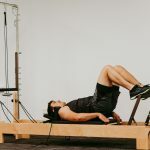 ​​Every session is facilitated by an Accredited Exercise Physiologist who is a certified Australian Physiotherapy and Pilates Institute (APPI) Pilates instructor. Our Clinical Pilates services are recognised under many Private Health Insurer policies as well as Medicare, Department of Veterans Affairs (DVA) and Return to Work SA. If you currently have a chronic health condition, you could be eligible for Medicare or DVA rebates. A 1:1 session for individuals who are new to Pilates, have ..
Offering sessions at both a beginner and intermediate level, Mat Pilates teaches the fundamentals of..
An equipment based small group session utilising the larger Pilates equipment including Reformer, Wa..